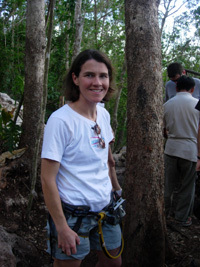 Dr. Robin went to a 3 year dental residency program at UNC focusing on endodontics. During this training, Dr. Robin focused her studies on diagnosing and treating endodontic issues. Treatments include root canal therapy, retreatment of nonhealing root canal therapy and surgeries on nonhealing root canal treated teeth. Dr. Robin is trained and up to date on the latest protocols to treat teeth following a dental trauma. Your general dentist sometimes refers patients for consultation when the diagnosis is complicated or when treatment is more difficult than normal. Aside from providing root canal treatment, Dr. Robin's role is also that of educator. It is important that patients understand why they require root canal treatment, what treatment involves and what they can do to ensure the best possible outcome. Dr. Robin believes that a properly informed patient has the best chance of achieving the optimal result. Endodontic therapy comprises of root canal therapy, retreatment of previous teeth treated with root canal therapy which have gotten infected and surgeries dealing with root canal treated teeth. 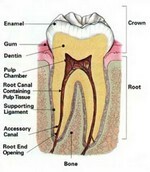 Endodontic treatment or root canal therapy is necessary when the pulp becomes inflamed or infected. The most common reasons for inflammation or infection are deep cavities (caries), repeated dental procedures, cracks or chips. Trauma can also cause inflammation and often shows up as discoloration of the tooth. 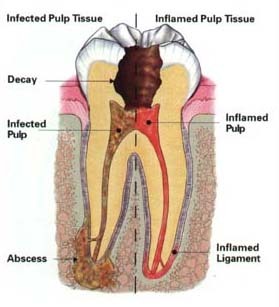 If pulp inflammation or infection is left untreated, it can cause pain or lead to an abscess. Indications for root canal treatment include prolonged sensitivity to heat or cold, discoloration of the tooth, swelling or tenderness of the tooth or adjacent gums. Sometimes there are no symptoms. The Endodontist removes the inflammed or infected pulp, carefully cleans and shapes the canal system and then seals the prepared space. Most cases are completed in one to two visits depending on the state of your tooth. Once treatment is completed, you may be instructed to return to your dentist for a crown or filling. The restoration of the tooth is an important part of treatment because it seals the cleaned canals from the oral environment, protects the tooth and restores it to function. Toothache pain is the main reason for patients seeking treatment. Fortunately, modern anesthetics can make the procedure pain free in most cases. Seeking treatment early makes the procedure more comfortable, so don't wait. When caught early, treatment should feel no different than having a regular filling. For the first few days after treatment, there may be some sensitivity to biting pressure. Sometimes over-the-counter anti-inflammatory medications (like Advil) are recommended for a day or two. Dr. Robin can prescribe other medications but they are rarely required.